As a beekeeper after the winter holidays I seem to be always looking to spring and I start thinking about getting out and working in the garden. Every year I try to pick a small project which typically turns into a large project. Usually, I focus on the on the vegetable garden however, this year my project is more about the property as a whole. My thought is to create a more sustainable yard as in less upkeep with the mower and create a more pollinator friendly space. Anyone can create a welcoming garden for pollinators. 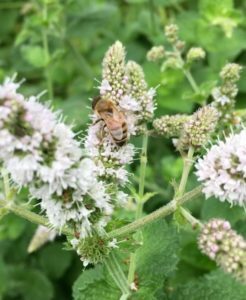 Turning your own yard or other property such as a schoolyard, work landscape, or roadside green space into a pollinator habitat is fun, easy and can make a difference for birds also. Planting a few flowers for your honey bees is like adding a few gallons of water to the ocean. Honeybees need on average about a square mile of good cover to forage on. However, adding a diverse mix of flowering plants to your garden will also attract butterflies, moths, hummingbirds, along with native bee species and the occasional wasps. These insects are essential to our survival and need to be welcomed into at the least a corner of our backyards. Besides providing a food source for pollinators flowers provide cover for other wildlife such as birds and also reduce neighborhood mowing area. I find an easy cover is the different varieties of mint. It grows fast, smells lovely, creates natural ground cover, excellent as edging or perimeters around gardens and also can be used in tea and an icy summertime Mojito. Another amazing aspect is that some species of mint actually repel insect pests such as ants and flies and even mosquitos. Creating a pollinator friendly lawn is the second part of this year’s project. A good pollinator lawn is made up of combination of grasses and low growing perennials. These offer pollen and nectar and can be used and treated as a typical lawn. Just as a regular lawn a pollinator lawn can be mowed however requires less maintenance and can be mowed higher providing a lusher fuller looking lawn. After some research I found a lawn mix seems very pollinator friendly and will hopefully decrease mowing frequency. It includes grass; Fine fescues (Festuca sp.) and broadleaf flowering varieties; White clover (Trifolium repens), Creeping thyme (Thymus serpyllum), Self heal (Prunella vulgaris ssp. Lanceolata), for sandy soils Ground plum (Astragalus crassicarpus) can be added. My lawn already contains white clover so I will add the others as an over seed.